Offer available for new and unregistered 2017 and 2018 Vanderhall Venice models. Subject to credit approval by Synchrony Bank. Rate of 6.99% for 96 months will be assigned based on credit approval. Not all buyers will qualify. Monthly payments will be $13.63 per $1,000 financed. Example: A total 96 month term with an Amount Financed of $26,955 and 6.99% APR requires monthly payments of $367.36 for 96 months. Your actual monthly payment may differ based on financing terms, credit tier qualification, accessories or other factors such as down payment and fees. Program minimum amount financed is $2,500 and minimum 0%-10% down payment required based on credit approval criteria. A 10% down payment is required to obtain advertised monthly payment of $367.36. 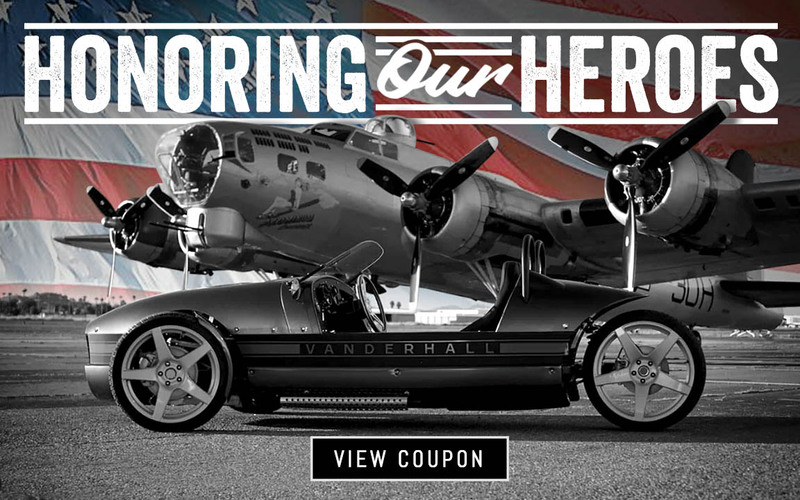 See your local Vanderhall dealer for details. Not offered in Hawaii. Offer effective from a participating authorized Vanderhall dealer between 03/01/2019 to 04/30/2019. $500 bonus accessory & apparel with the purchase of a new 2018 or 2019 Vanderhall.